Athlete's foot is a skin disorder officially known as 'tinea pedis'. It is caused by a group of fungi called dermatophytes and is pretty contagious, often being caught on the floors of changing rooms and swimming pools. It thrives in warm, dark, damp environments so your son's sweaty trainers are heaven for this fungi! The symptoms of this minor but annoying problem are a flaky, itchy rash on your foot, mainly between the toes, sometimes accompanied by an unpleasant odour. Sometimes the fungal infection also spreads to the nails causing unsightly yellowing and drying of the nails. Who can contract Athlete's Foot? Well, it hasn't acquired the name for no reason! Walking barefoot around swimming pools and changing rooms as well as spending long periods of time in sweaty trainers will dramatically increase your chances of picking up the infection. Athlete's foot is more common in young men than women, possibly due to the fact that they are more likely to wear runners/trainers a lot. A typical scenario being a teenager running around, playing football and getting sweaty feet that then remain in the sweaty, damp shoes all day long. It could also be said that boys play more team sports and tend to pick up the condition in changing rooms and through shared towels. Hydrogen Peroxide is an extremely powerful natural remedy that can be used in the treatment of all types of infection. Its broad spectrum antimicrobial properties mean it can deal with not only fungus, but also viral and bacterial invaders too. When applied to the foot there will be an instant reaction as the extra oxygen molecules become free, producing a fizzing sound. 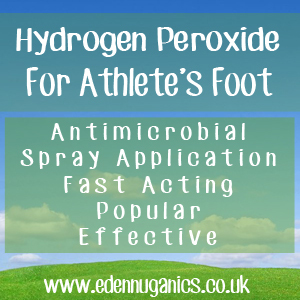 As well as being applied to your feet, H2O2 can also be sprayed to the inside of trainers after use to help remove any lingering pathogens and prevent re-infection. Mix one pint of 3% Hydrogen Peroxide into around 8 pints of lukewarm water. Leave your feet to soak for 20-30 minutes twice a day as needed. After use it's best to let your feet dry naturally, making sure there is no moisture on them before putting your shoes and socks back on. Make sure you're using 3% food grade hydrogen peroxide, as stronger concentrations can be harmful to the skin. In fact, 90% hydrogen peroxide has been used in the production of rocket fuel; probably something best avoided on your feet! Apple Cider Vinegar - Apple cider vinegar is another age-old remedy in the treatment of Athlete's foot. Simply soaking the affected area in a bowl of warm water and raw apple cider vinegar twice a day is known to deal with the infection in a matter of days. For this remedy we use a ratio of 2 parts water to 1 part ACV. Make sure when buying your apple cider vinegar to only purchase bottles that are both 'raw' and 'unfiltered'. Colloidal Silver - Colloidal silver is a broad spectrum antimicrobial that can be used in the treatment of Athlete's foot to great effect. Simply spray or mist over the affected foot 3 times a day. Be sure to only buy colloidal silver in a dark glass bottle and store it in a dark cupboard, as light will dramatically reduce its shelf life. Bicarbonate of Soda - Bicarbonate of soda kills bacteria as it produces an alkaline environment and bacteria thrive in a more acidic environment. It also works well as an anti fungal agent. Sprinkle some in your shoes after wearing them, or create a paste with a little bit of distilled water and rub onto your feet and leave it there for 15 minutes before rinsing off. This is also a great way of reducing foot odour as baking soda can absorb bad smells. You can also add some bicarbonate of soda to some warm water in a basin and soak your feet for 15 minutes.